Downstream data and downstream video signals at 1490- and 1550-nm wavelengths are downloaded to the users by the 2×2 MMI, while upstream data carried by 1310-nm wavelength is uploaded to the central office by the reflection of Bragg grating. The researchers, led by Prof. Fuwan Gan, from Shanghai Institute of Microsystem and Information Technology, Chinese Academy of Sciences, designed a compact triplexer based on silicon nanowire waveguides. Because of the high index contrast between silicon and silicon dioxide, the size of the structure is greatly reduced with a footprint of 2.5×911（μm）. Besides，the design satisfied the bandwidth requirements of the industrial standards ITU-T G.983. It is reported in Chinese Optics Letters Volume 11, No. 4, 2013 (http://www.osapublishing.org/col/abstract.cfm?uri=col-11-4-041301). Fiber-to-the-home (FTTH) system has been developed to meet the ever-increasing demand for bandwidth. Triplexer, as one of the key components in FTTH system, is widely used to provide a triple play service, i.e., the wavelengths of 1310, 1490， and 1550 nm carry upstream data, downstream data， and downstream video signals, respectively. The cheap and compact triplexer has an enormous market demand. 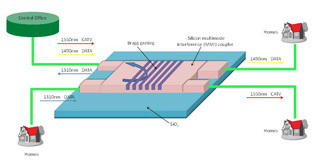 In response to this demand, the researchers designed a compact triplexer based on silicon nanowire waveguides, and the device can be readily fabricated using a commercial CMOS process. The industrial standards ITU-T G.983 has a special bandwidth requirements, where 3-dB bandwidths of 100, 20, and 10 nm for wavelengths λ =1310, 1490, and 1550 nm are required respectively. Traditional structures were difficult to meet the bandwidth requirements. In order to meet the special bandwidth requirements, the researchers embed the Bragg-grating into the 2×2 multimode interference (MMI) coupler to de/multiplex the three wavelengths, and the asymmetrical ports were introduced in the MMI structure to satisfy the bandwidth requirements. 3-dB bandwidths of 100, 22, and 15 nm were obtained for the wavelengths of 1310, 1490, and 1550 nm, respectively. "The fabrication of the triplexer is planned and we are now coordinating with the fab," Prof. Fuwan Gan adds, "the experimental results will be reported in future work."